The NNSS Counter Terrorism Operations Support (CTOS) program’s mission is to develop and deliver the most realistic and highest quality training in support of homeland security using extensive radiological expertise with the unique assets of the NNSS. The nation’s premier radiological/nuclear weapons of mass destruction (WMD) counter-terrorism training center, the NNSA CTOS–Center for Radiological/Nuclear Training at NNSS has trained America’s first responders since 1998. CTOS represents the NNSA’s Nevada Field Office (NFO) as a charter member of the National Domestic Preparedness Consortium (NDPC). The mission of the NDPC is to enhance the preparedness of federal, state, local, and tribal emergency responders/first receivers and teams, including non-governmental organizations and the private sector, to reduce the nation’s vulnerability to incidents involving WMD, terrorism, and all-hazard high-consequence events by providing technical assistance and developing, delivering, and assessing plans, training, and exercises. The NDPC operates under the oversight of the Department of Homeland Security (DHS), Federal Emergency Management Agency’s (FEMA) National Preparedness Directorate (NPD) National Training and Education Division (NTED). Over the years, CTOS has substantially contributed to national preparedness, training responders from all 50 states and each U.S. territory. Since September 11, 2001, more than 200,000 first responders have been trained through various methods of delivery. Today, CTOS delivers training and education needs of more than 13,000 emergency responders in state, local, and tribal governments each year. The NNSS CTOS program develops and delivers training for emergency responders to take immediate, decisive action to prevent or respond to terrorist use of radiological or nuclear WMD, such as radiological dispersal devices (RDDs) and improvised nuclear devices (INDs). Training and course materials are provided at no cost to eligible participants. Courses are conducted at NNSS, municipality-hosted locations, and online. For a list of all mobile, resident, and online courses, visit the CTOS website at: www.ctosnnsa. CTOS courses, except for the awareness-level and online courses, are performance-based using multiple types of radioactive material, most of which use special nuclear materials, such as uranium and plutonium. Courses are designed so participants receive only minor radiation doses—lower than a chest X-ray or a typical round-trip airline flight across the United States. The radiation levels are sufficient to learn techniques required in an actual incident involving much higher radiation levels. Each participant operates and employs radiation detection and measurement instruments throughout the course. Participants train with radioactive material in classroom practice, scenario-based drills, and performance evaluations. 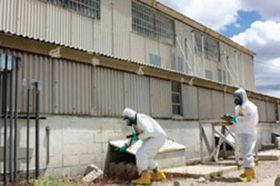 After the terrorist attacks on September 11, 2001, the CTOS training program converted the T-1 Site at NNSS into a training center demonstrating an American community attacked by terrorists using an IND or multiple RDDs. Four nuclear devices were detonated at this location between 1952 and 1957, and the small amount of nuclear fallout remaining from these detonations is now below the surface of the soil, providing a realistic and safe training area today. The soil at the T-1 Site emits low levels of radiation, which simulates widespread radiological contamination from an IND or multiple RDDs, yet poses minimal risk to participants. Adding to the realism, radioactive debris created during the nuclear detonations, such as twisted steel fragments and sand melted into radioactive glass (trinity glass or trinitite), are still scattered throughout the T-1 Site. Industrial, sealed radioactive sources are also placed in exercise areas to create higher levels of radiation as needed for training objectives. The T-1 Site covers approximately 40 acres, allowing over 100 emergency responders to participate simultaneously.